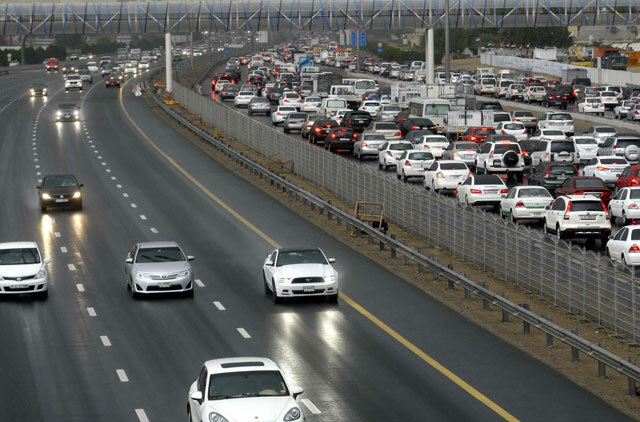 Dubai: Motorists on Thursday were faced with more than just the morning rush-hour after a night of rainfall left roads clogged with water and heavy traffic jams. Light to moderate rain was reported in Abu Dhabi, Dubai and Sharjah, affecting school buses and residents on their way to work. Major delays were reported on the Shaikh Mohammad Bin Zayed (MBZ) Road from National Paints intersection to Mirdif City Centre, as drivers were gridlocked in traffic jams for over 40 minutes. At 8am, traffic accidents had broken out on the road between Sharjah Industrial Area 8 and Al Qusais Industrial Area 3, causing traffic jams in the direction towards Damascus Street. Several locations in Sharjah were also experiencing very serious traffic jams, including those in the vicinity of Abu Shagarah Park, Cultural Square, City Centre Sharjah, Mega Mall, King Faisal Mosque, Al Majaz and the Sharjah Airport International Free Zone. Another accident also held up commuters on Shaikh Zayed Road at the Al Manara interchange, adding further traffic woes to motorists heading towards Dubai. Motorists were stalled on Shaikh Zayed Road as traffic built up on Al Garhoud Bridge and all the way towards the Dubai World Trade Centre. Tailbacks were reported near Dubai Silicone Oasis, Ras Al Khor Road towards Business Bay and on MBZ Road towards Jumeirah Village Triangle. Authorities urged motorists to take extra caution and reduce speeds when navigating wet passageways and highways, to avoid accidents. “Reduce speed during heavy rain to avoid any hydroplaning,” the Dubai Police advised.